In a series of meetings over the past month, student activists and University administration officials developed plans for the potential creation of an endowment to support long-term financial aid for undocumented students, as well as programs to help accommodate such students throughout their time on campus, according to the student activists and member of the administration. Student members of Freedom at Emory University, a campus group advocating for undocumented students’ rights, met with Senior Vice President of Development and Alumni Relations Susan Cruse on Feb. 27; Senior Vice President and Dean of Campus Life Ajay Nair on March 3 and Provost and Executive Vice President of Academic Affairs Claire Sterk, Assistant Vice Provost and Dean of Admissions John Latting and Financial Aid Director John Leach on March 11. The discussions followed two preliminary meetings between University President James W. Wagner and members of both Freedom at Emory and Freedom University, a Georgia-based undocumented student leadership school and advocacy organization, on Jan. 28 and Feb. 18. College senior and Freedom at Emory co-founder Andy Kim and College sophomore Julianna Joss met with Cruse to discuss ways to give undocumented students not only the means to attend the University but to make the most of their college lives, according to Kim. According to Cruse, a research team within the Office of Development and Alumni Relations recently began its search for foundations that specifically raise funds for undocumented students. Emory would likely have to compete with other universities to receive a grant from one of these organizations, which, as the donors, would ultimately decide the applicant requirements and uses of the endowment, Cruse said. Cruse, according to Kim, was both positive and well-informed in terms of undocumented students’ rights. Though she cautioned that the University’s grant cycle system only allows it to accept grants every six months, specifically in June and November, Cruse praised the students for their proactiveness in meeting with her so early. When asked how soon her office would take action, Cruse said that, once the office finds a suitable endowment, only the University’s policies stand in the way. “As soon as the University says, ‘Yeah we’re ready to go,’ we’re ready to go,” she said. Next, Freedom at Emory members Samantha Stevens, a College senior, and Catherine Tang, a College sophomore, met with Nair, who offered multiple ways to integrate undocumented students on campus, such as a student mentoring program. In an interview with the Wheel, Stevens noted that many schools provide such programs, in which freshmen undocumented students are matched with older such students, who help their mentees navigate courses, campus organizations, campus jobs and other areas of college life. The University of California at Berkeley and the University of California, Merced, for example, provide such programs. 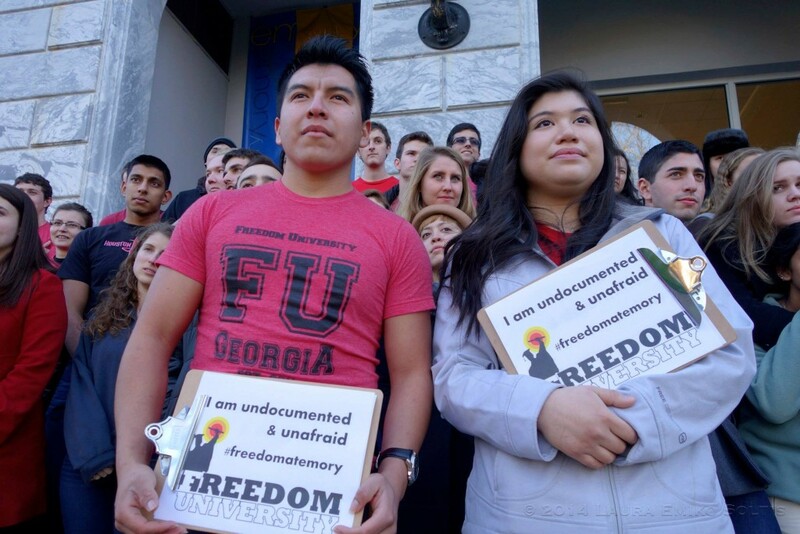 “We can’t just bring undocumented students to campus — we can’t stop there,” Kim said, who was informed of all of the meetings’ discussions by fellow Freedom at Emory members. Kim explained that undocumented students are barred from attending many colleges and are often forced to delay their freshman year until they can gain acceptance into a school that accepts students living in the U.S. without citizenship. In 2011, the Board of Regents of the University System of Georgia implemented Policy 4.1.6, which states that “a person who is not lawfully present in the United States” is ineligible for admission at colleges within the Georgia System, which include the state’s top five public schools. Policy 4.3.4, also implemented by the Board of Regents in 2011, does not allow undocumented students to apply for in-state tuition. Thus, undocumented students are generally a bit older than the average freshman and have spent a few years working rather than coming to campus straight from high school. “Based on the conditions they usually come from — and I don’t mean to generalize — there are needs that we don’t know, just because we’re not undocumented,” Kim said. Stevens cautioned that the mentorship program should be sustainable and shouldn’t make the undocumented student mentees uncomfortable. “Sometimes even at schools that are positive toward undocumented students, that [program] can break down, and [undocumented students] feel like they don’t have a place,” Stevens said. She added that Nair recommended several schools to potentially assist in the development of the program. Nair and Stevens both mentioned training of orientation leaders (OLs) and resident advisors (RAs) to be aware of undocumented students’ needs as ways to further integrate such students on campus. Nair also suggested the University channel the 1915 Scholars fund, which supports first-generation undergraduates, toward undocumented students. Stevens emphasized her satisfaction with the rough outlines of undocumented student initiatives developed at the meeting. “Nair really seems to want this to happen,” Stevens said, though she added that he recognized the need for both short-term and long-term goals. For this issue, Stevens and College junior Nowmee Shehab met with Sterk, the provost and executive vice president of Academic Affairs, along with Latting, the assistant vice provost for Undergraduate Enrollment, and John Leach, the director of the Office of Financial Aid. Sterk called the discussion a “positive conversation about the use of institutional financial aid” but cautioned that the administration could not address the immediate needs of incoming undocumented students this spring, who will receive little to no need-based financial aid. All of the Freedom at Emory members interviewed by the Wheel emphasized the importance and the urgency of these students’ needs. Though Latting acknowledged that the meeting did not result in “a commitment to admit and award need-based aid to undocumented students,” he wrote in an email to the Wheel that the group left with an understanding of the necessary steps for providing need-based aid to undocumented students. The University, Latting wrote, would have to assess the students’ need using its institutional application, while taking into consideration the fact that they are not eligible for state or federal aid. If Emory were to develop need-based aid grants to target this subset of students, he wrote, the aid would have to serve as a replacement grant for unattainable federal and state aid. “From my perspective, this was both a solid proposal and an action to be taken,” Latting wrote. The Freedom at Emory students plan to regroup with Wagner in the coming weeks, now that they’ve gathered information from necessary department officials, Kim said. Correction (3/20 at 2:17 p.m.): In paragraph two, the article stated that Ajay Nair is the executive vice president and dean of Campus Life. He is the senior vice president and dean of Campus Life.